-Great size for a shooting guard at 6-7. -Good instincts getting in passing lanes. -Struggles to finish around the basket. Made just 42% of 2-point attempts at U19s. Shies away from contact. Doesn't use off hand. Outlook: Staple of the Turkish national junior teams since the age of 15. Fifth summer in a row playing for the national team despite only being 19. Saw a handful of minutes this season in the Turkish league and Euroleague for Anadolu Efes, but mostly played for their second division team (Pertevniyal), where he was up and down. Extremely talented, but gives off a vibe as being somewhat of an underachiever. Lacks intensity and consistency. Has a definite chance to be a NBA player if he can maximize his potential defensively and become a consistent outside shooter. 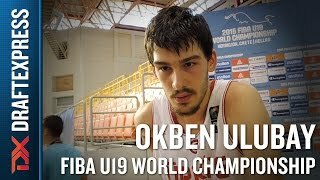 An interview with Turkish small forward Okben Ulubay at the 2015 FIBA U19 World Championship in Crete. -Good defender when he wants to be. -Little bit passive at times. Too cool for school? Outlook: Early-bloomer who has played at the U16 European Championship already as a 14-year old (when he was playing with a reportedly fake passport that listed him as being a year younger). Do-it all type guard with really nice versatility and a strong feel for the game. Doesn't always play with the same intensity level.